Before you play Mornington Crescent it is assumed that because it was Thursday yesterday you will know that the short rules only apply and from the 2nd turn in reverse order during April. Please also remember rule 7b: All Egyptian moves are disallowed except crossovers and double takes. Please avoid all surface lines that back onto Mrs Trellis's home between 7pm and 7am on a Friday. Mornington Crescent is a game for all ages but to really appreciate the nuances and some areas of complex game play, adult guidance may be necessary. Mornington Crescent game play is for those beyond Primary school age only. (A simpler children's version will be released in 2-3 years). All Stations to Mornington Crescent! The Little Book of Mornington Crescent offers a lot more than mere analysis. With painstaking accuracy, the authors plot the game's history, from its origins in the Roman Empire to its present day popularity as a subject for discussion on the Internet, radio and TV. The official, definitive, exhaustive, complete history and doings of the antidote to panel games: I'm Sorry I Haven't a Clue. 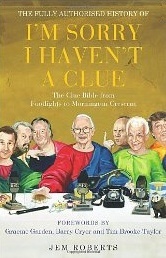 With forewords by Graeme Garden, Tim Brooke-Taylor and Barry Cryer. A fascinating guide to the conventions and game play involved in Mornington Crescent. The forward from Mr Livingstone provides some useful insights. Site Map Send Feedback with questions or comments about this web site.